Four outstanding students from Comet Bay College Gifted and Talented Pathway have again wowed the judges at the National Final for the Subs in Schools Competition. Team Alia Astra, consisting of Team Manager and Construction Engineer Mari Conradie, Design Engineer Lachlan Stephen, Graphics and Media Manager Connor Siekman and Marketing Manager Aidan Blanchard have succeeded in placing second in the Australian finals. The School Pathway Program has successfully supported student STEM pathways to careers in Defence Industries since 2010. 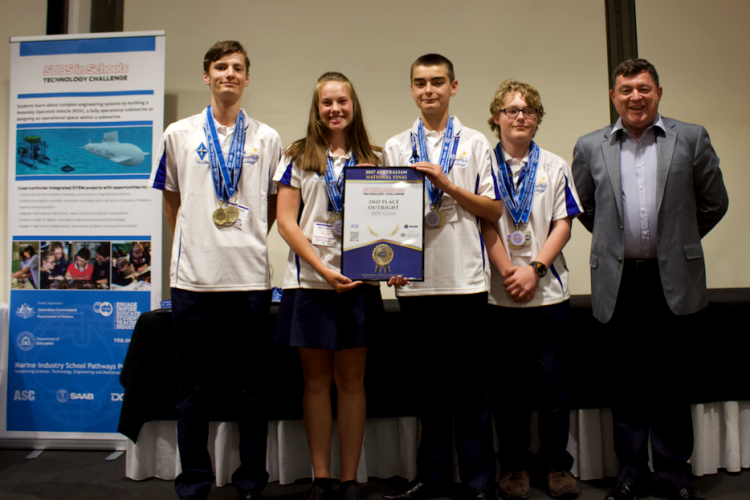 This program is funded through a national partnership between the Department of Defence and WA Education Department and has supported the involvement of teams in Australia’s Subs In Schools Technology Challenge. Along with second place, these students were successful in winning the Best Managed Enterprise and Best Team Portfolio. This is a fantastic achievement for Comet Bay College’s first time competing. The four students are already planning for next year’s event.